The best way to bring about that shift is to put a transit pass in everyone’s hand, and make transit affordable. But recent moves toward fare increases and fare gates mean that we’re actually increasing emissions. Transportation is the biggest source of greenhouse gas emissions in Metro Vancouver. Of the just over 10 million tonnes of greenhouse gases that we emitted into the atmosphere in 2010, a majority (53% or 5.5 million tonnes) were caused by vehicles. TransLink estimates that switching from car to transit will reduce a person’s CO2 emissions over four-fold, from 224 grams of greenhouse gases per km travelled to only 50 grams. The reduction may be even more significant. Although 16% of commuters take public transit, they contribute only about 1% of vehicular emissions (0.07 out of the 5.5 million tonnes). Today two-thirds of commuters drive to work, but if we could make it possible for them to take transit instead, then the amount of total pollution we pump into or air could be cut almost in half. Recently, TransLink has been moving in the opposite direction. In 2013, transit fares were increased by up to 12%, and TransLink itself estimated that “the 12% fare increase will mean 2% fewer-than-otherwise riders on its system.” Essentially this means pushing commuters back onto the road. On January 1st, TransLink cancelled the Employer Pass Program, used by 27,000 employees everyday or more than 10% of daily transit commuters. A counter-petition argued that TransLink had not studied how many of these commuters will revert to commuting by personal vehicle. On top of all this, Translink decided to invest $195 million in fare gates, which will cost $15 million per year in order to collect only $5-7 million in estimated “fare evasion.” The entire system would be redundant if we all had universal passes. These are all disincentives to ride the bus. Vancouver needs hard targets to incentivize the transition from personal vehicles to mass transit. In the City of Vancouver proper, City Hall’s current target of reducing car travel from 55% to 50% by 2020 is not going to make us the “greenest city in the world.” The best way to make a real shift is to put a pass in peoples’ hands. When you do that, people use transit. One case-in-point is the student Universal Pass (U-Pass), which has been extremely successful in getting people to switch from cars to transit. In the first year of the program ridership increased 53%, breaking all expectations. The U-Pass has now been extended to 11 colleges in the Lower Mainland. It costs students around $35/month. The Employer Pass was another good example of a progressive program. Former Vancouver City Councilor Tim Louis proposed an expanded program funded by employers across the Lower Mainland, at a monthly cost similar to the student U-pass. Passes can also be distributed on a geographical or “community” basis. When all non-student residents living at UBC had access to a pass, participants used transit 65% more than they had prior to the project. Such passes could be provided at significant discounts in Vancouver neighborhoods. 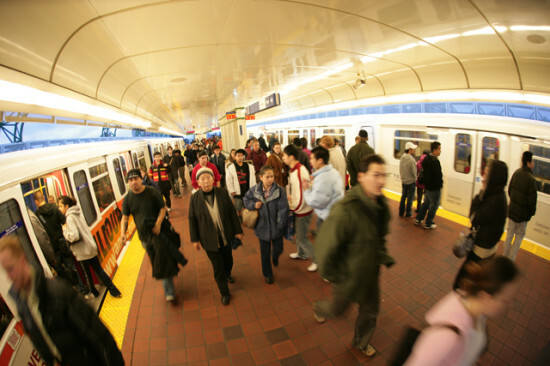 For example, it was calculated that all residents of the Point Grey neighborhood could be given a community pass for $25 per month, while remaining “revenue neutral” for the transit system. Such community passes have been successful across North America. In Boulder, Colorado, a community transit pass has increased ridership in participating neighborhoods by 50%. In Bellevue, Washington, ridership increased by 30%. The cost of universal passes need not be carried fully by the individual rider, but may be funded wholly, or in part, by taxes – including business and property taxes. There is much to learn from some trail-blazing cities around the world. Hong Kong’s transit authority relies heavily on business property taxes, since businesses benefit heavily from public transit that brings more customers to their doors. The impact of subsidized or free transit passes can be astounding. In 1997, the Belgian city of Hasselt implemented a free transit system under the motto “the city guarantees the right of mobility for everyone.” Ridership increased by 900% in its first year and 1223% by 2001. To pay for the free transit system, the municipality funds a third (taking up only 1% of the city’s budget) and the other two-thirds is supplemented by national government. Last year the city of Tallinn in Estonia – a tech savvy city with a population of 400,000 – abolished transit fares for city residents, barred cars from some roads, and increased parking fees in order to decrease congestion and help pay for increases in transit ridership. After the first two months of the program, traffic decreased by 10% or 7,600 fewer cars in the city per day. 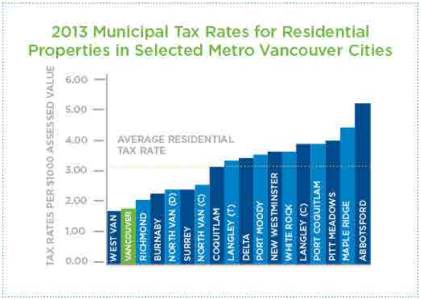 This City of Vancouver figure shows that our property tax rate is well below the regional average. About 35% of TransLink’s revenues come from fares, so if the City of Vancouver wished to provide passes for all residents it would, like Hasselt, have to fund one-third of operating costs – a rough estimate being $150 million annually. Note that the City of Vancouver’s property tax rate is well below the regional and national average, and has the second lowest combined taxes in the world. We can afford to reduce greenhouse gas emissions. Cities need to find ways to put a universal bus pass in the hand of every resident. In Metro Vancouver, with its high rents, the transit pass should be funded through a progressive method which does not add to the cost-of-living of those struggling to make ends meet. Only then will we cut our 10 million tonnes of greenhouse gas emissions in half, and begin doing our part as a city to fight climate change. Buildings were the second largest cause at 42%. Calculated for 2010, but mode share stats based on 2006 census. We’ll see how many transit riders have reverted to car travel only when Translink releases the 2013 ridership data this upcoming spring. We won’t see the fallout of this policy until the 2014 ridership numbers are released in the spring of 2015. Original research on community passes and free transit systems was conducted by Karen Fung and Taryn Urquhart (unpublished). Rough estimate to provide completely free transit for all current transit riders in the City of Vancouver based on: 1) TransLink’s 2012 budget of $463 million in fare collection across Metro Vancouver; 2) TransLink estimates that 30% of ridership is within the City of Vancouver. Posted in City Hall, Transit. Bookmark the permalink. Impressive fact finding! It’s only unfortunate that more people do not see the mobility of their employees and fellow citizens as a necessity that the city should be working to make as accessible as possible to all. The problem with “free” services is that there is no incentive by anyone to provide it – how many bus drivers will offer their services for free? On the other hand, shared-consumption services like lyft and sidecar are an excellent, practical and immediate examples of making our transportation more efficient. Taking on an extra commuter into a single-occupancy car doubles energy efficiency to the degree that cannot be matched by any public transit system short of the highest density places like Hong Kong, New York or Tokyo. Vancouver had a great solution to peak hours congestion – the city removed street parking during the 2010 Olympics adding 33% or even more 50% more capacity to existing streets. No need to pave over any more green space, just using our existing streets more efficiently. A complimentary policy would be to allow significantly more new housing in central areas easily served by transit. It’s a tragedy that most of Vancouver is still zoned for freestanding housing only – we should upzone the entire West Side. Apart from the student and working group, there are two groups (the poor and the retired people) they need more helps. Take into the account of a large group of poverties and retired people who are the main keys: poor people use transit that is more affordable and the retired people may not be possible to take the challenge of driving. It is a matter of community responsiblity that we need to care about. This can be enhanced by allowing them to benefit from the usage in the non-congesting periods of the days. I believe we are not target of lower carbon emission. We might target to low carbon emission by also lowering the cost and reduce the expenses of all travelling groups. The problem is translink needs to expand and has no money. Handing out free passes is very costly. Your right, a third of operating costs are paid for with fares. More people can’t fit on transit right now. The 99 B-Line passes up thousands of people every day. If we hand everyone passes, many more will simply be passed up. We need new revenue to expand the system, not diminishing Translink’s already strained revenue sources to try to stuff more people into a system that is quite full. Number one priority should be the skytrain extension from VCC Clark to UBC, not free passes. Surrey really wants an LRT, and they deserve it, but the ridership demand simply sin’t there. Broadway is the busiest bus corridor in north america, carrying nearly the ridership of the Canada Line and far more than the evergreen line will. It needs to be expanded. Problem is, even if we find consensus tomorrow,the line won’t be completed until well after 2020. By then it will be a very serious bottleneck, especially after the evergreen line increases ridership at Commercial-Broadway by 25% and they all hit a brick wall where the Millennium line just stops. There is going to be a very serious, economy and environment damaging congestion on Broadway for many years to come.